If you’ve read any of the history on my blog you can pretty easily find my own version of the Cherry-Lime. It doesn’t take much to make something like this, there are a dozen different ways you can put cherry, soda and lime together. Breaking down the differences would be a work of years. This little number came from a family dinner at Red Robin. They call it the Cherry Lime Flip. You can see the general ingredients below. 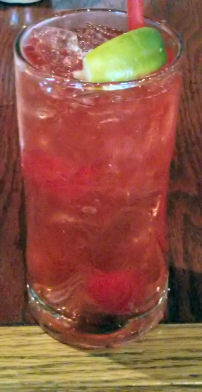 The cherry flavor is coming from the Skyy vodka and the cherries themselves. Given the color I think there might be some cherry syrup involved but that could be coming from the grenadine. I have to question the addition of grenadine here, nothing says wtf? in a drink quicker than the wrong fruit. Then I remembered that a franchise like this is more than likely using a super fake grenadine that is more corn syrup and dye than pomegranate juice. It’s a very drinkable little number. I’m not getting the lime that I wanted to out of this and the cherry is very fake being a vodka flavoring but I’d have it again. Posted in Drink Review.Tagged cherry lime, cherry vodka, lime juice, red robin.